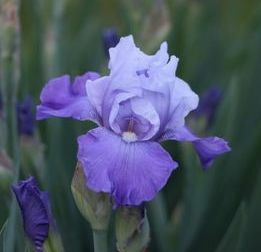 'Silgrey's Beauty' ( Terry Varner, R. 2007) Seedling #97-15B4. BB, 21" (53 cm). Midseason bloom. Standards light blue; style arms same, darker blue midribs; falls medium blue; beards white tipped orange, orange in throat; ruffled; slight fragrance. Seedling #94-23B1: ( 'Pink Bubbles' x Lynn Markham seedling #85-3B3, 'Satin Sashes' sibling) X (seedling #V-109: ( 'Abridged Version' x seedling #P-148) x Lynn Markham seedling #85-3B3). Hermit Medlars Walk 2007.